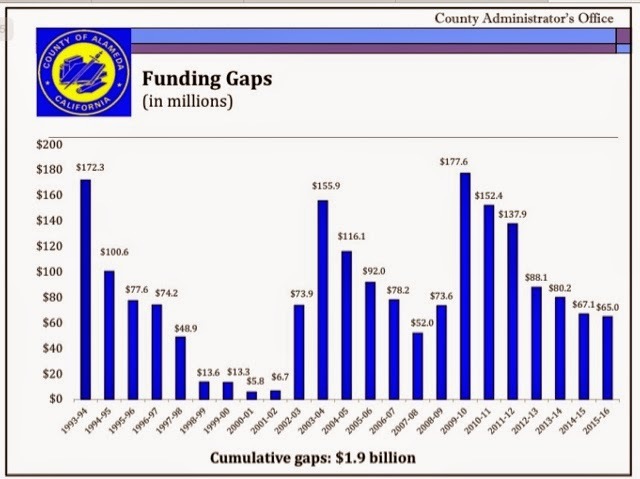 BUDGET | Alameda County’s budget funding gap for the 2015-16 fiscal year is $65 million. The shortfall was announced Wednesday in Oakland at a county budget work group meeting and is roughly the same as the $67.1 million deficit the county closed last year. The budget estimated released to department heads and community-based organizations, though, shows the county’s rebound from years of triple-digit deficits is stalling. Alameda County’s estimated $2.3 billion general fund budget amounts to a 3.2 percent increase in appropriations over last year, which Alameda County Administrator Susan Muranishi called “modest” in light of rising salaries and benefits and cost of living increases. Meanwhile, revenues have only risen by less than a half percent. “I know there’s a perception that revenues are up, the economy is doing a lot better,” said Muranishi. “Why do we have a funding gap?” Although the county’s discretionary revenues such as property tax receipts are up by $29.5 million over last year and vehicle registration taxes have risen by nearly $10 million, the shortfall is offset by increasing demand for services still struggling to receive restoration of cuts stemming from the height of the last recession. “We have a revenue problem,” said Muranishi. She suggested in the coming weeks the county find solutions to increase revenue derived from county programs. Reevaluating budgeting for the voter-approved hospital sales tax dollars and realignment funding from the state for incarceration of county inmates and reducing recidivism could be on the table as the county begins discussions over how to balance its budget starting in May. While the unemployment rate in Alameda County is inching closer to five percent, said Kai Mander, Alameda County’s principal budget analyst, demand for social services is still high. The quality of life for many upper and middle class residents has improved, said Mander, but the poor continue to struggle. He posits the county’s unemployment rate fails to take into account residents who have exited the job market and those underemployed to the level county services are needed to make ends meet. 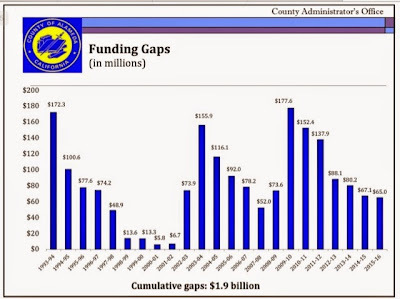 In contrast, during the 2009-10 fiscal year, Alameda County’s funding gap bottomed-out at more than $177 million, leading to several rounds of deep cuts to services for the young, poor and disabled that still persist. County officials hope Governor Jerry Brown’s budget revise next month will include more spending for social programs. The proposed state budget earlier this year increased funding for programs mostly centered on education, said Mander, but future funding increases in the near-term are unlikely. However, Alameda County Supervisor Keith Carson believes the state’s economic outlook is rosier than has been reported. “The state is doing better than what it’s publicly putting out there,” said Carson. In addition, the county also maintains a $200 million budget reserve, said Muranishi, and its economic outlook was recently moved from stable to positive, according the Fitch credit rating agency. In the next few weeks, Muranishi said, county staff will seek a consensus on areas of the budget to target for possible cuts and offer the Alameda County Board of Supervisors 3-4 options for balancing its budget. A proposed budget is scheduled to be released in early June, she added, and approved just before the June 30 fiscal year deadline. Posted in Alameda County, Alameda County Board of Supervisors, budget, funding gap, Jerry Brown, Keith Carson, social services, Susan Muranishi, unemployment, working poor. Bookmark the permalink. Yet no one talks about cutting the Sheriff's Budget. We need to increase the Sheriff's budget and lock up and warehouse all the 'human' trash out there.